The purpose of this module is to limit the start up current of large power amplifiers. A big transformer has a low DC impedance on the primary side, and thus draws a huge start up current even if no capacitor bank is connected. This can blow fuses of up to 10 Amperes easily. When a big capacitor bank is added, this makes the start up problem even worse. Also the high charge currents will limit the operational life of the capacitors. 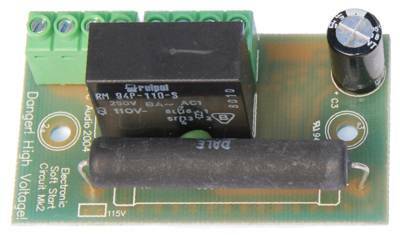 With this module mounted, the transformer and capacitor bank is started up slowly; power is limited with a 330R power resistor with high pulse handling specifications. After 3 seconds a quality relay jumps the mains power directly to the transformer. Thus, after the slow start no circuitry except the high reliability relay contacts are in the power path - eliminating losses. It has shown there is a positive effect on the sound quality, compared to adding the power directly. Normally, it takes ½ to 1 hour from turning on the power until an amplifier sounds optimally. With a soft start circuit this warm up time is reduced to a few minutes. Presumably because some of the negative effect on sound quality, that is normally experienced on amplifiers without a soft start circuit comes from the huge start-up current on the capacitors when cold starting the amplifier. This current can be in the reign of 70 - 200 Amperes. This soft start circuit is designed for ZAPsolute and Millennium XP amplifiers, but can be used with advantage in almost any construction with large transformers and capacitor banks. The module is mounted with two 10mm M4 threaded spacers and Torx screws (all included). The distance between the mounting holes should be 54mm, the soft start module measures 70*40mm and needs a building height of 38mm (incl. spacers). The module can be used for both 230VAC and 115VAC operation. For 115VAC it is necessary to mount a single jumper on the PCB. The position is marked "115V". The Soft Start module, solder side.